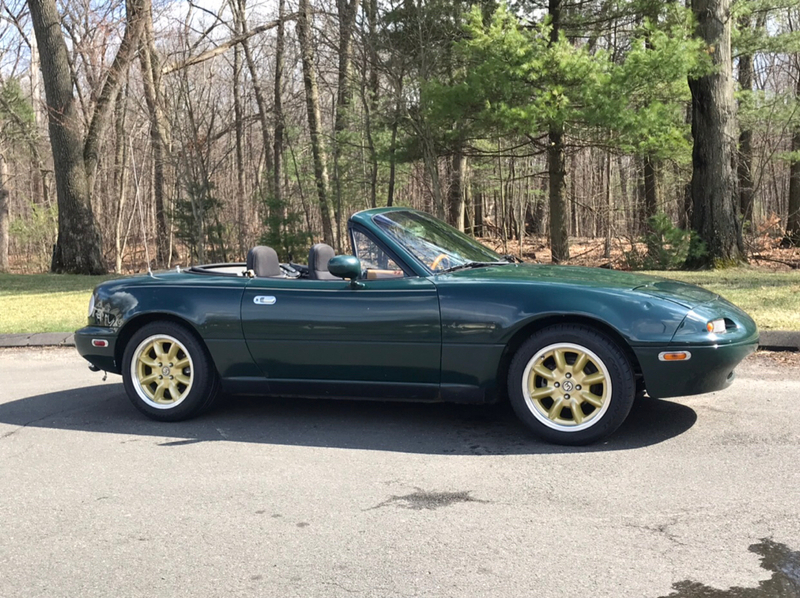 I've yet to start working on the Miata as work has been crazy with the change of season. I did however pick up a new daily last week. 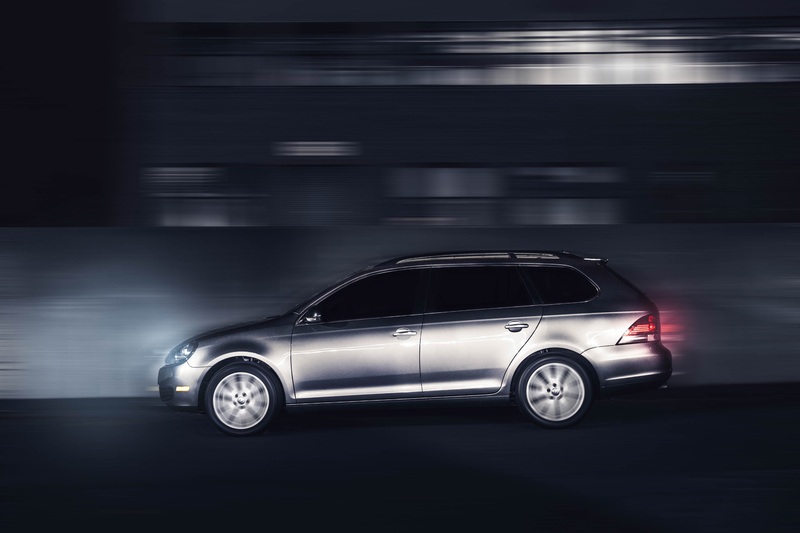 2013 Jetta Sportwagen, TDI 6MT. This thing is KILLER on fuel. New fenders acquired! Hopefully I can get them installed tomorrow or Saturday. They're not in perfect condition bet they're much better than my crappy old rusty ones. With these, I'll feel more comfortable holding off on body work until next year when I have a more steady income. After what seems like a forever, I've finally gotten around to doing at least a little bit of work to the car. 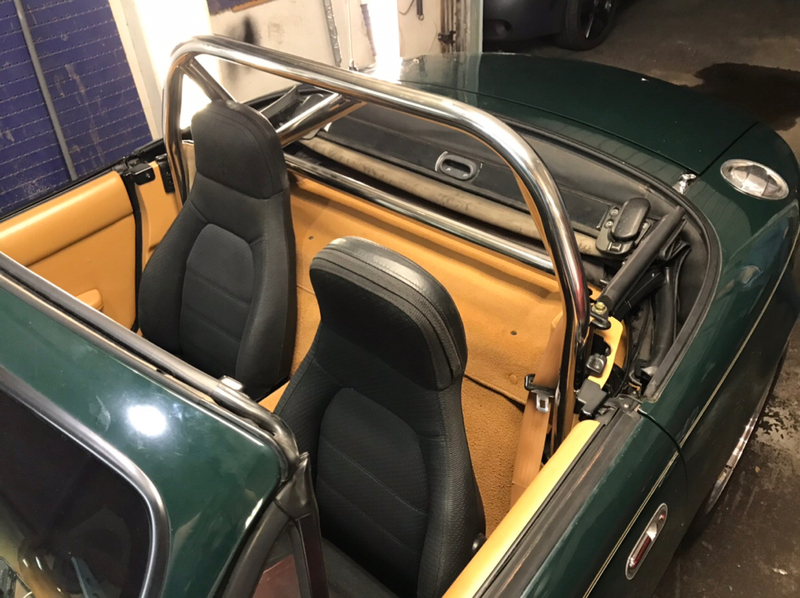 My fenders were rotted well beyond repair so I sourced some used BRG fenders last spring to replace my old ones. I picked up a set of wheels locally for a very reasonable price. They're probably temporary, but for now I think they look pretty good. As you can see from the photos, I have a few parts kicking around waiting to be installed. I'd like to have most of them installed by Miatapalooza but my schedule is pretty crazy with work and school. Hopefully I'll have some more updates for you guys soon. I know what that's like (to be partially disassembled and have parts all over the garage)! You'll get there. Take your time and do things right, there's nothing worse than rushing something and wanting to go back and do it better. I had pinstripes on my BRG, too. A heatgun will make life much easier, but a hair drier may suffice! Today I received the first component to revamping my cooling system. 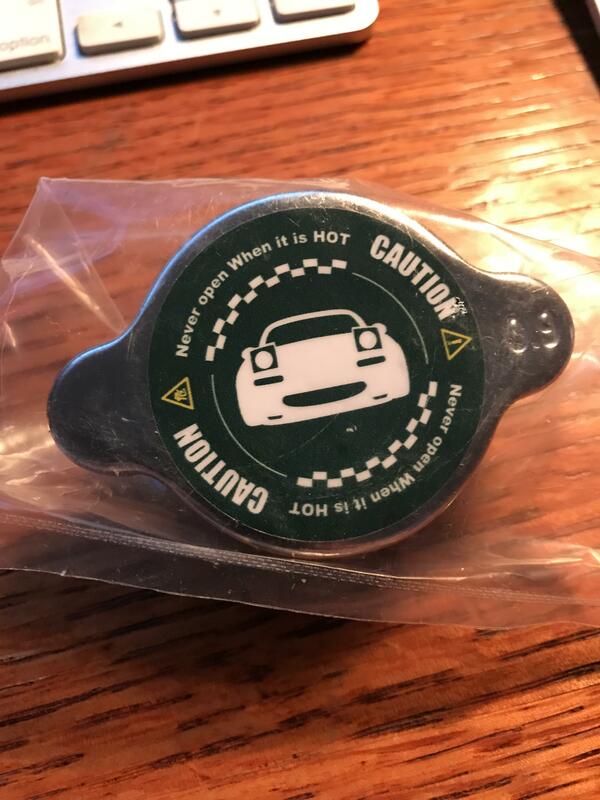 As soon as Ken Auto posted these I ordered one since a new radiator cap was on my list of things to purchase. Project downdate. 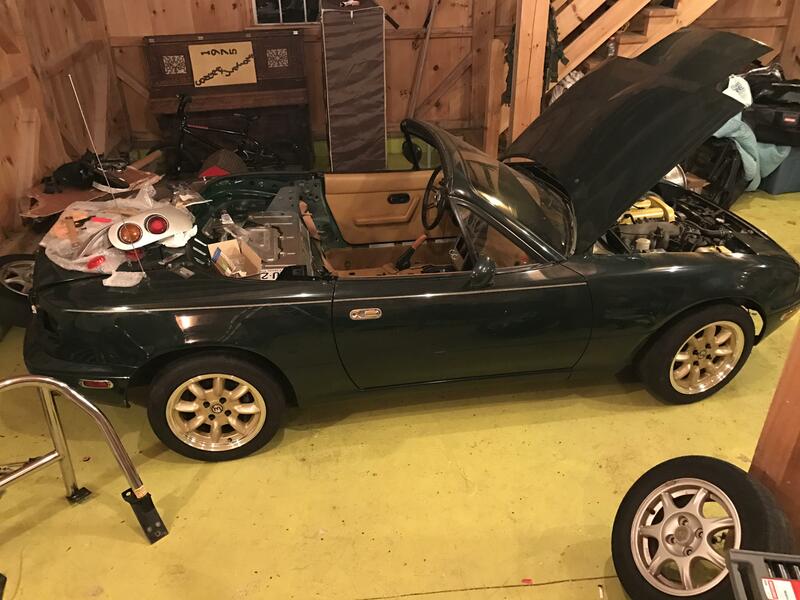 It seems the Miata needs a new engine. I haven't driven the car in about a year and a half. This past week I told myself I wanted it on the road by my birthday in august so I could enjoy the tail end of summer and autumn in New England in the car. I've needed to replace the throw out bearing for some time now, so I went ahead and ordered an FM happy meal kit. To prepare the car for the clutch installation I started her up and moved to a more open part of my garage. As soon as I started the car I knew there was something wrong. A strange new noise was coming from the engine bay. I broke out my mechanics stethoscope and began to search for the source. It appears to be coming from the bottom end of the motor, front and center, just above the crank pulley. I'm going to pull the engine to dig a bit further, but am counting on needing a new one. My thoughts are to swap in a BP4W. I'm hoping to have some good news in the near future. I finally found some time to work on the car last week. 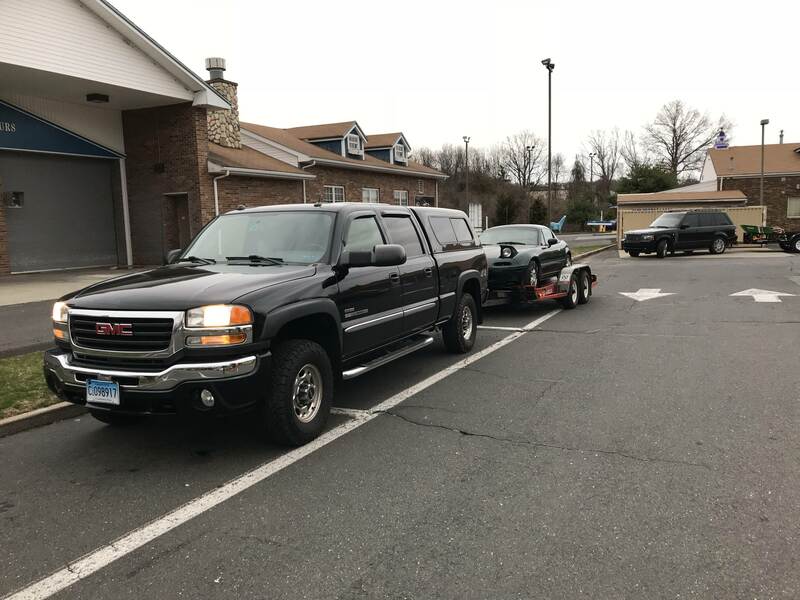 I towed the car up to a friends shop. How nice it is to have a lift! We got the engine out, and upon closer inspection the noises turned out to be a bad water pump. New timing belt kit, with all of the wear items replaced and we’re back in business. We also installed a new FM Happy Meal kit. I’ve always been of the mindset of upgrading parts when your replace them. I’m excited to get through the break in period to properly drive the car once again. 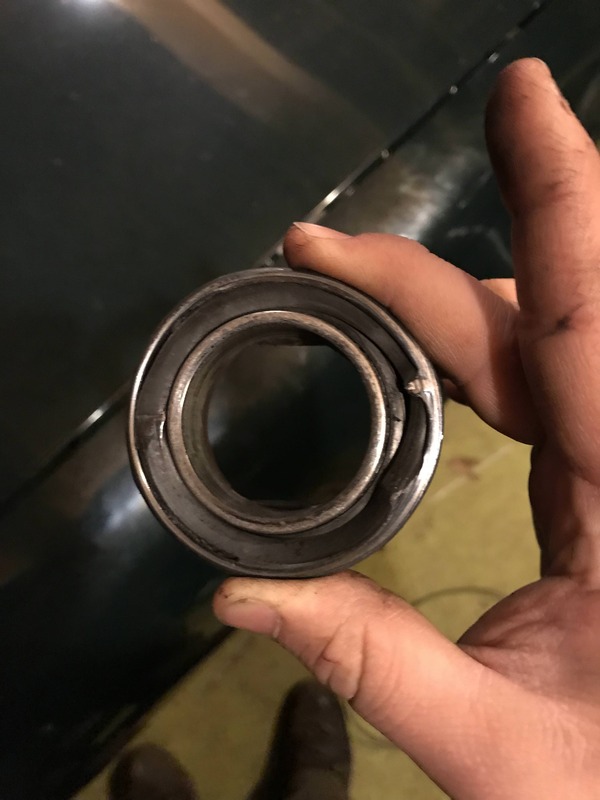 Here’s a photo of the old throw out bearing. It was rough to say the least. 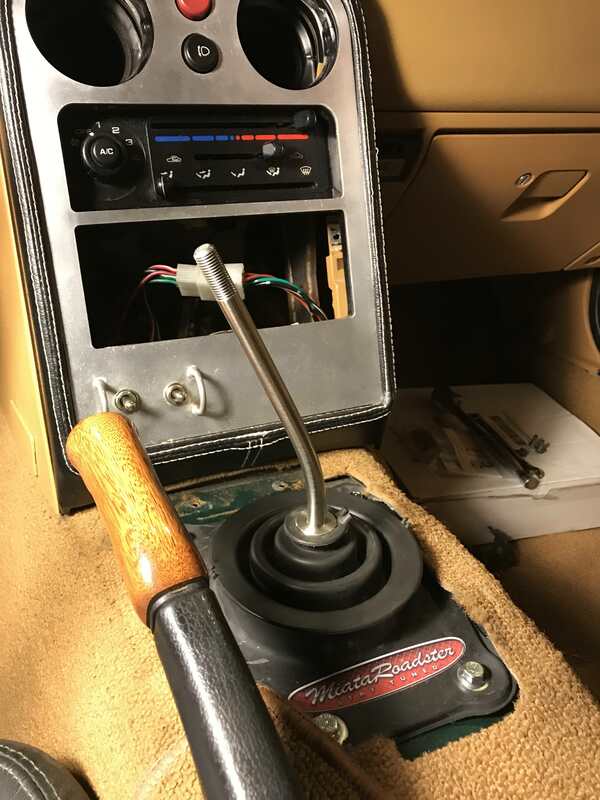 To finish up the install of the transmission, I installed the MiataRoadster short shift kit that I ordered over a year ago. Wow did this make the shift feel great! Now that the car is roadworthy again, I hope to have some more updates in the near future. It’s been far too long. 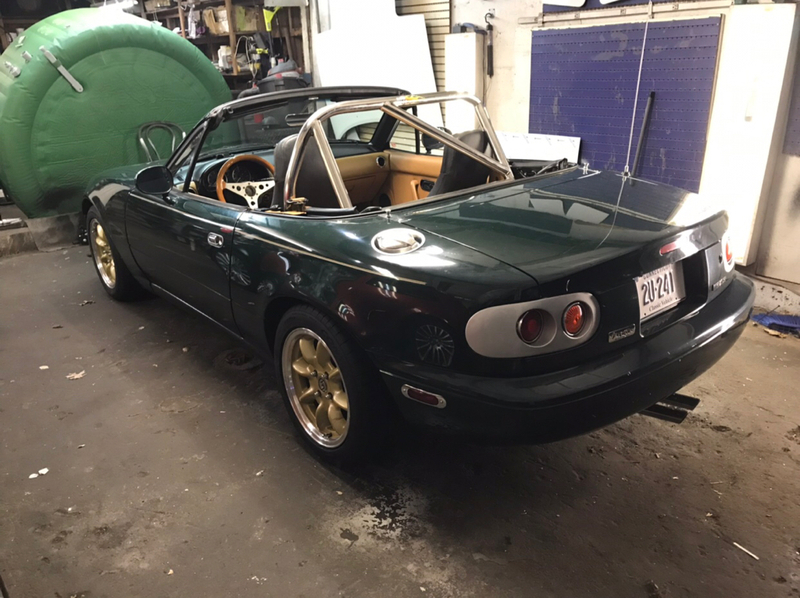 That shift kit from MiataRoadster is a great upgrade!!!!!!! I managed to find a little more time out in the garage today. I installed a few parts I’ve had sitting around for too long. 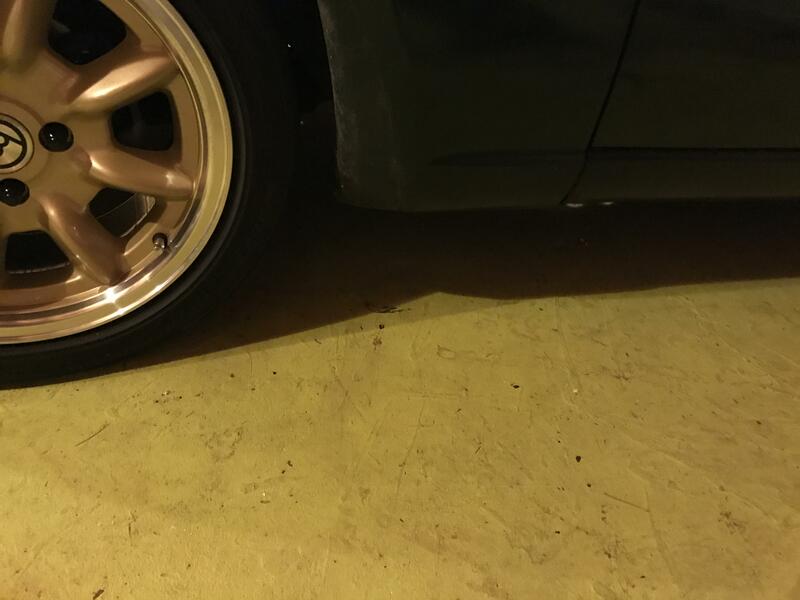 At the front of the car, a set of KG Works TSI’s. Overall a decent fitting part with a really nice retro look. The tail lights were purchased second hand and the wiring harness was a mess. 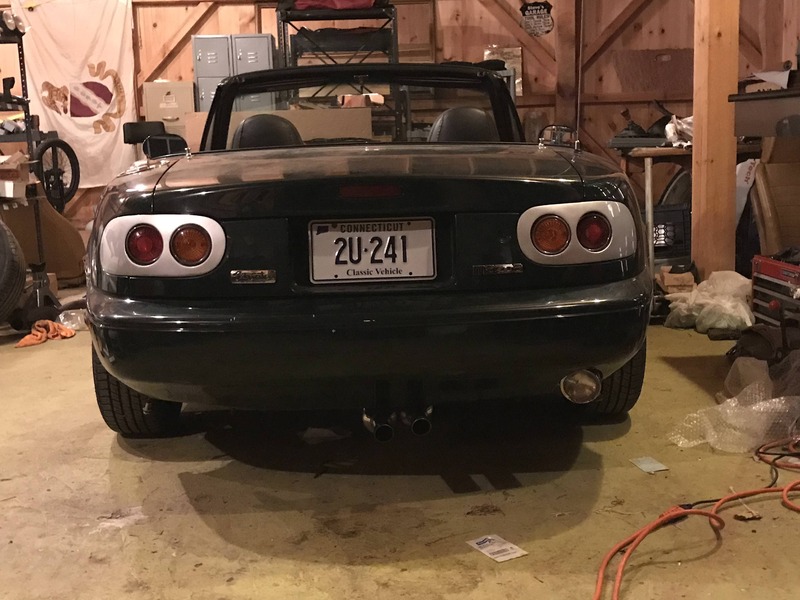 I built an entire new harness using some old stock taillights I had. They need to be painted still, but that will happen when the rest of the car does. Hopefully later this year. The Reverse light is a lot nicer than I expected it to be. 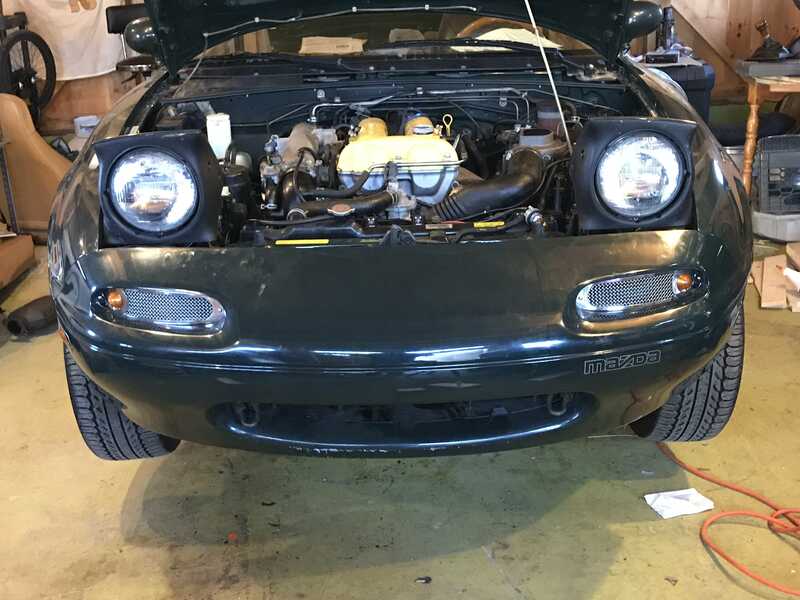 I didn’t know what to expect when I ordered it from Bill at MiataRoadster, I guess I was expecting a generic round light. The kit came with a nifty tool to hold a bolt during install. The housing feels high quality, and the lense has a nice design that disperses light well. The Pitcrew exhaust is, by far, the best modification yet. I went into this purchase blind, or deaf rather. There simply aren’t any good sound clips of this carback anywhere to be found on the Internet. I searched for hours on end hoping to find even one high quality video to give me an idea of what this would sound like. I knew I didn’t want a loud exhaust and definitely didn’t want something raspy. I more I looked at photos, the more I knew I had to have it. The center exit, the 60’ British sports car vibe it gives off is just too cool. THIS IS THE BEST SOUNDING EXHAUST I’VE EVER HEARD! 1994 Red Miata "The Red Pill"
This weekend I got a bit more work done on the car. 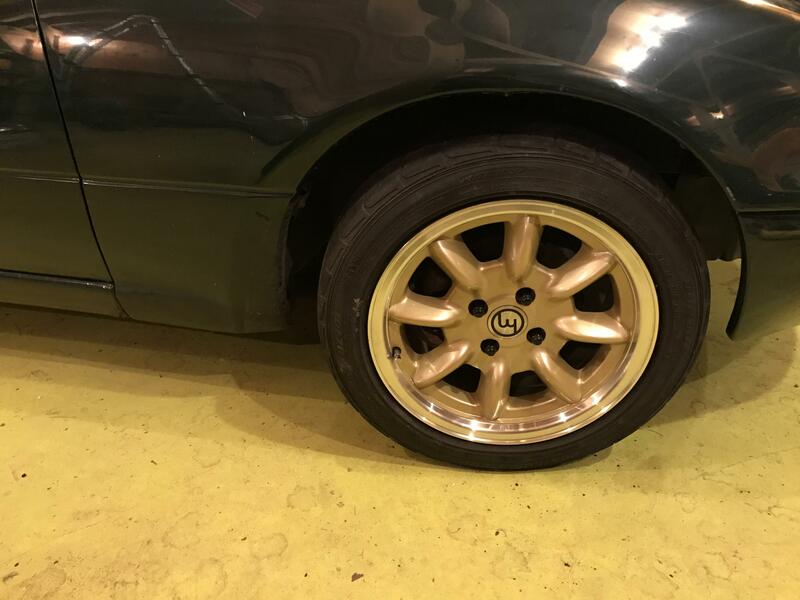 By recommendation of several miata driving friends, I bought a set of 205/50r15 Continental extremecontact sport tires, and mounted them on Chaparral wheels that I’ve had for a few years now. My initial impressions are great. 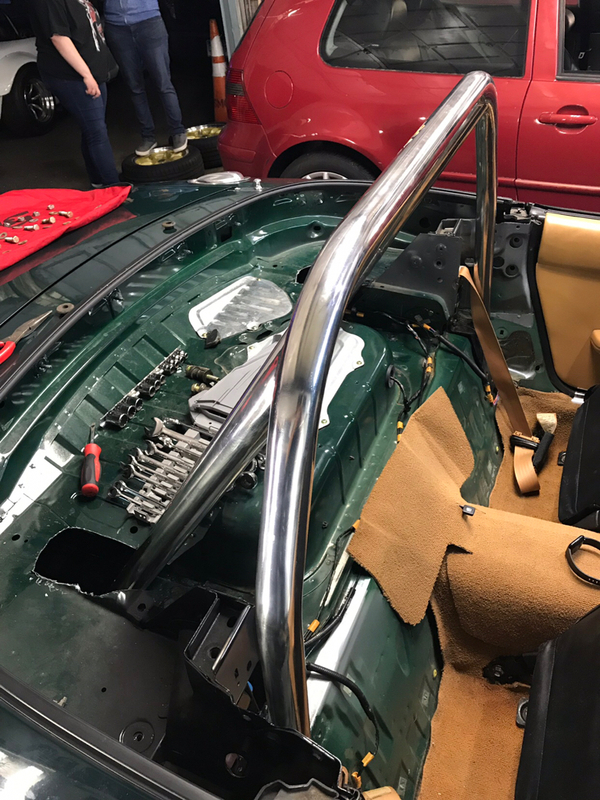 The next thing to tackle was installing a very handsome, stainless steel Hard Dog roll bar. I admit I got a little carried away with the sheers when trimming the deck, I should have taken a little more time to think it through, but life goes on. This is the first time since I bought the car that I look at it and really smile about what I’ve put together. Hopefully I find some clean tan seats soon to bring the interior back. I’ll consider those if I can’t find a set. Do you remember which color you ordered?